Enter the lands of Leland Province, where dragon and human societies have long dwelled side by side. Superstitions rise sharply, as a severe drought strips the land of its bounty, providing fertile ground for the darker ambitions of Fordon Blackclaw, Dragon Council Leader, who seeks to subdue humans or wipe them off the face of the land. As the shadow of danger creeps across Leland Province, a young dragon named Kallon Redheart, who has turned his back on dragons and humans alike, comes into an unexpected friendship. Riza Diantus is a young woman whose dreams can no longer be contained by the narrow confines of her village, and when she finds herself in peril, Kallon is the only one with the power to save her. Yet to do so means he must confront his past, and embrace a future he stopped believing in. A tale of friendship, courage, and ultimate destiny, Redheart invites readers to a wondrous journey through the Leland Dragon Series. "First I'm a beggar, then I'm a field mouse. I'm skinny. I'm trouble. You don't know anything about me, but you're always angry with me. You watch me as through I'm going to do something criminal-"
"You believe that taking risks in life will lead to sorrow. You believe that death is a bitter end to a bitter existence." "Hawk spit! I'm no spy, you pale runt!" Redheart is the first book in Jackie Gamber's Leland Dragon Series published by Seventh Star Press. It's an excellent YA fantasy adventure, full of magic, intrigue, excitement, love and fast-paced action. This beautiful and heart-warming story will no doubt enthrall readers of all ages! Kallon Redheart is a red dragon, last in the line of reds and a rightful leader of the Leland province. He's a loner, who long given up on dragons and humans alike. After witnessing his parents being murdered, he decided he's better off on his own, far away from any human villages or dragon communities. He does not wish to be bothered by anyone, he enjoys his self-imposed solitude and the sense of peaceful emptiness his secluded cave provides. Riza Diantus is in many ways Kallon's opposite. She's a young female on a quest to find meaning in life. She always felt that life was more than just getting married at young age and bearing children. Her mind was constantly wandering beyond the borders of the village she lived in. Her father often scolded her for not thinking like a normal girl should. He wanted her to marry, have children and lead an ordinary life. Refusing to consent to her father's wishes, aching to explore the world beyond her hometown and experience some unforgettable adventures, Riza escaped from home and set out on a journey that would change her life forever. She's brave and strong-willed, but her uncontrollable curiosity often gets her into all sorts of trouble and so she frequently needs to be rescued. Needless to say, she's in trouble when she first meets Kallon and she becomes the sole reason for our red dragon to finally leave his cave and face the world. Kallon and Riza develop a strange, but wonderful bond. Annoyed with Riza's noisy and nosy attitude at first, Kallon soon realizes that he's enchanted by her genuine and caring character. As the story progresses, these two get more and more attached to each other and they find their strange and unique friendship oddly comforting. But of course, it would all be too easy without the bad guys throwing obstacles in their way, right? And so we're introduced to Jastin Armitage, a vicious dragon hunter, who has some serious beef with the dragon kind. He, too, lost his family when he was a child. His family was mercilessly killed by a dragon, and since then Jastin is a sworn dragon hater, set on killing every last one of them. And if he gets payed for that? Well, that's even better! As bad to the bone as he might sound, Armitage is in truth a very complicated and hard to read character, who at times shows a great capacity for affection and love. He's not your typical black character, who is evil for the sake of being evil. Quite to the contrary, he's the kind of character that often makes you wonder which path would he have chosen to follow, if his parents haven't been brutally killed in front of his eyes. Things get even more complicated when Jastin meets Riza and seems to be smitten with her from the very first moment that he lays his eyes upon her. Being dark and evil as he is, he doesn't let his feelings show easily, but he does a great deal to help Riza every time our damsel fins herself in distress. Tension rises between dragons and humans, the province is on the verge of war. The Dragon Council Leader, Blackclaw, is using the situation to strengthen his leadership and fulfill his self-seeking ambitions. Riza finds herself thrown into the chaos of the human-dragon conflict. Accused of being a spy, she's held captive in the Wing Valley, the oldest of all dragon communities. Not only her freedom, but also her life is in great danger. To free her, Kallon has to get out of his comfort zone and find in himself how to be the leader he's destined to be. 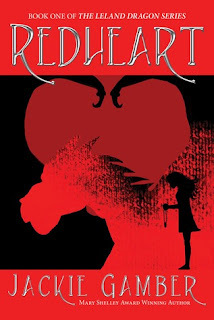 Redheart is a captivating and enthralling book. A lot of things were done right; the language is beautiful, the writing is solid, the pacing is great, the characters, while sometimes their actions were a little haphazard and unpredictable, are fully fleshed out with their own unique complexities. That's especially true in Jastin's case. What a brilliant character he is! He's not 100% bad, nor 100% good. Just when you think you have him all figured out, he does something so unpredictable that you find yourself gasping or pulling your hair out. I think Jastin is one of the main reasons I thoroughly enjoyed this book, he turned an already wonderful fantasy story, into a total page-turner. I just had to keep on reading to find out what will happen to him! I do hope there will be plenty of Jastin in the second installment of the Leland Dragon Series. Jackie Gamber has a fantastic way with words. She doesn't just tell the story, she paints it with her words. The scenes, the characters, the places.. they're so vivid and real, you can almost taste the fresh lake water, feel the wind in your hair and the sun on your skin! It's like she was born to write fantasy stories! It truly is a great and enjoyable piece of YA fiction that promises a lot from future books in the series. Jackie built a wonderful world filled with colorful dragons, magic, interesting characters and intriguing places. Her book, even though intended for younger readers, can easily be enjoyed by adults of all ages. In my opinion Leland Dragon Series has a huge potential and if Jackie keeps up the great work I'm pretty sure that the next books in the series will be even better. I'm so looking forward to reading them! Evie - I just grabbed a tea and devoured your review! You make this sound like such an amazing story - as I'm sure it is. This really is a wonderful review, thanks for the introduction to this author! Great book quotes! And any book that has a horse involved gets my attention. Thanks for this one. Great review! This sounds like a really good read. I love dragon stories. I've not heard of the book. Thanks for the heads up! New book for me too --off to add to my wishlist. Wonderful review, you totally made me want to read this book! Sounds like a beautiful and magical story! And I love the quotes, especially the third one, it's so funny! Dragons are awesome. Haven't heard of this yet but I would love to. SWEET... I love when I stumble upon books I've never heard of that seem to be a great read. Thanks for introducing us to Redheart! You totally made it sound intriguing. Even though it may appeal to the younger crowd, my adult self wants to read this now. It sounds so cute! I like books where the characters learn and about themselves and change overtime. I've never heard of this novel before, but you make you it sound so good I have to put it on my wishlist.I am eager to meet Jastin! I am actually nearly finished read Redheart! I didn't know if it was my sort of book when I first recived it but I am really enjoying it :) Great review! I heart Redheart! Glad to see another dragon book. I love them and this cover looks great. Will put on the wishlist! Thanks for the review. I love stories about dragons.. Will definitely read Redheart! Though the cover is incredibly red, the image on it so intriguing and a little creepy. If I saw this in a bookstore, I'd be immediately compelled to read it. The story itself sounds incredibly interesting and Riza sounds like a protagonist I would definitely love. I will definitely be keeping an eye out for this one! Great review!